Zebra print rugs will be right at home in so many different room themes either on the floor or hung on the wall. Depending on the area, you may choose to use your zebra skin as wall decoration or to put on the floor. At one time the only zebra rugs available to decorators were real zebra skins that they used as area rugs and wall hangings. However, many homeowners that would reject the idea of decorating their floors or walls with a real zebra skin on principal might consider a faux zebra rug. Even if you have no concern for endangered species or have no objections to real fur; zebra skin rugs are not cheap. 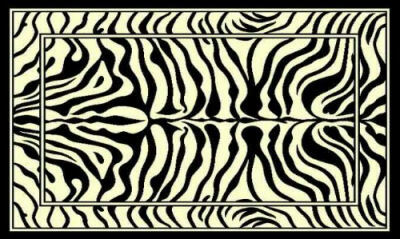 In fact if you happen upon an inexpensive rug that is advertised as being zebra skin it is probably cowhide. You can find them in sizes from as small as 2 X 3 feet to as large as you would ever want for a den or living area. It's my opinion that faux fur zebra rugs are more durable than a real zebra skin rug could ever be and they can be found at a cheap price. Thankfully we can find plenty of zebra print area rugs and accessories without having to kill an animal for its hide. There are zebra print rugs made of faux fur, zebra latch hook rug kits, and your traditional knotted wool rugs dyed in a zebra pattern. There are quality zebra area rugs to fit any space in fanciful colors and brown and white as well as the realistic black and white zebra striped rugs that you may expect. Do you see what I mean, when I say you could easily become overwhelmed with zebra print items and accessories? A zebra print rug could easily be the highlight or centerpiece of any African safari lover’s trophy room, it would completely diminish the impact of the rug to have too many zebra print items scattered elsewhere in the room. If a faux zebra rug is not your idea of suitable floor covering, and you happen to have a large expanse of wall to decorate, you be consider hanging your zebra skin look-alike on the wall rather than placing it on the floor. An adult room is not the only style of decor that calls for the use of animal print accessories. 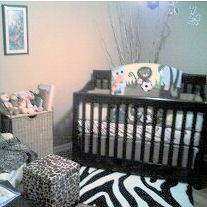 For example, a zebra baby bedding sets and zebra print rugs for the nursery are an excellent combination. Out of all the jungle animal prints in the market today, zebra is the most versatile and can handle more pops color than most. With a zebra print rug you can change out your accessories on a regular basis with color schemes ranging from hot pink to lime greens. You will certainly get your decorating moneys worth with a zebra print rug on your floor regardless of which room you choose to decorate with it. 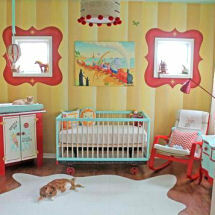 Please make plans to visit again to find the latest in zebra area rugs and baby nursery ideas.